An otherwise wonderful weekend was dampened by a Frenchman. As we started up the cars to leave Big White, Jenny's car let up a cloud of smoke as the fan belt ripped apart. On further investigation, it became evident that the coolant was frozen solid! Three weeks ago, Jenny had her car worked on at Langley Chrysler and had paid for a 'peace of mind' inspection. Jenny wisely called the service manager, Andre, in Langley who at first would not take responsibility. After some persistence from Jenny, he seemed to be fess up a little. The car was towed to Kelowna and we brought Bjorn and Jenny back to Langley. Today she got word that the engine was OK and only some hoses and belts need to be replaced. Hopefully, Langley Chrysler will take responsibility. The car still needs to be retrieved from Kelowna. 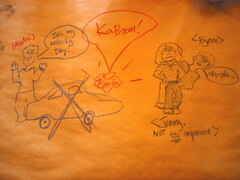 Jenny drew this picture on the 'tablecloth' at Montana's in Kelowna. Thanks for the blog....those dang Frenchmen! I am going into Langley Chrysler tomorrow morning to talk things over with Andre and the service manager. Andre was very nice to me today when I talked to him, and wants to make sure everything gets worked out. So check my blog tomorrow evening or the next day to see what the results are!